New Year's Update: An additional 0.12" on New Year's Eve brings the final December total to 5.85", more than 90% above average. It's the wettest December in over a quarter century, since the 5.91" in 1983. As noted earlier, it's also the 7th wettest overall. The final total for 2009 is 45.96", putting the annual average for the decade at 42.58". Six of the years in the decade have been at least 15% above or below the long-term annual average. That equals the maximum number of such extremes also observed in the 1950s and 1980s. 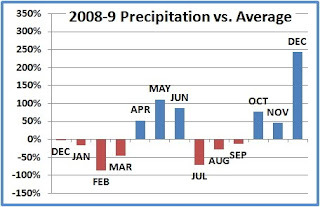 New charts added: Annual precipitation amounts and departures, decadal annual averages. Tune in next week for temperature analysis. With 0.31" of wintry mix and rain showers so far this New Year's Eve day, the Washington, DC December precipitation total is now almost 90% above average. This is a little ahead of the 87% excess of June, but well short of the 111% in May. December is the third consecutive month of much above average precipitation and the sixth of the year, with 5 out of the 6 being over 50% above. November, at 46% above, just missed the 50% level. 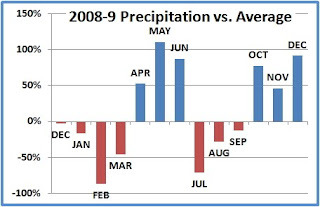 Two of the dry months, February and July, were more than 50% below average, so a total of 7 months this year had more than a 50% deviation. This December is now the 7th wettest in Washington history. 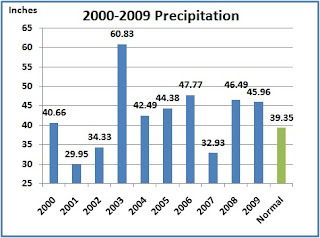 The annual total of 45.84" is over 6" more than the long-term average of 39.35", but still lower than the 46.49" in 2008. Seven years this decade and 6 out of the last 7 years have been above average. 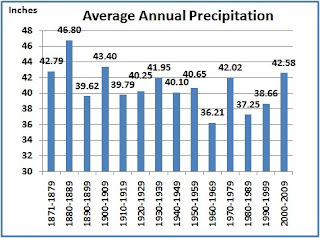 The annual average of 42.57" for the decade 2000-2009 is the wettest in a century and the third wettest overall, behind 43.40" in 1900-1909 and 46.80" in 1880-1889. Actually, the 1870s were slightly wetter with an average of 42.79", but they include only 9 years, since official records began in 1871. Tune back in over the New Year's weekend for final monthly and annual totals, plus more charts. December 25 Update: The New Orleans daily climate report confirms the earlier rainfall estimates. 11 PM CST Update: Today's unofficial total: 0.50", monthly total: 25.43". 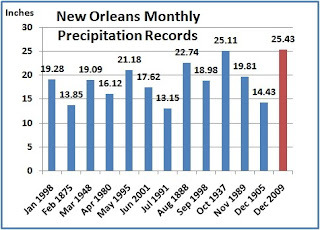 As noted last week, New Orleans doubled its previous December precipitation record in the first two weeks of the month and was closing in on the all-time monthly record. With 0.36" of rain so far this afternoon in heavy thunderstorms, the monthly total is now 25.29", exceeding the previous record of 25.11" set in October 1937. Light rain continues to fall as more showers move through the area. Meteorology (EAPS in MIT-speak) professors Kerry Emanuel, Ronald Prinn, and Richard Lindzen, discussed the hacked emails (widely pimped as "ClimateGate") from the Climate Research Unit of the University of East Anglia with two political scientists on December 10.
. . .things that are unethical and in many cases illegal . . . willingness to destroy data rather than release it . . . bad things going on . . . elite hysteria . . . devastating for popular support for science . . . scandals, cheating and arguments . . . bizarre changes [to the data] . . . The public is being thrown catastrophes. My view of the risk is that we have no other planet to retreat to if we are wrong. After pounding the Washington/Baltimore area with record-setting snowfall, the Super Saturday storm left massive amounts of snow on parts of New Jersey, Pennsylvania, Connecticut and Long Island before departing out to sea. Nevertheless, a report from Bloomberg today indicates that last-minute shopping in the remaining days before Christmas may make up for lost sales over the weekend. Despite the reputation of "Black Friday", the maximum day for retail sales is usually "Super Saturday" on the weekend before Christmas. Overall, the 10 days before the holiday make up 40% of sales for the months of November and December, according to Bloomberg. On Long Island, the 26.3" of snow at the National Weather Service office in Upton set a new single storm record, breaking the old record of 23.0" in the blizzard of 1978. Providence, RI set a new all-time December daily snowfall record with 14.3". The storm total of 23.2" at Philadelphia is the second highest all-time storm total. The record is 30.7" in the blizzard of January 1996. Many locations set individual daily records for December 19 or 20. 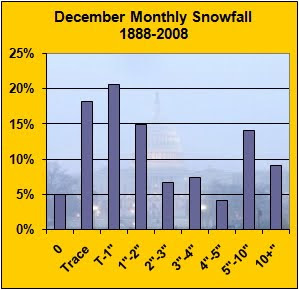 SNOWFALL RECORDS BEGAN IN 1884. SNOWFALL RECORDS BEGAN IN 1893. Sunday PM Update: Added monthly record chart, updated unofficial measurements. For Dulles and Baltimore, these are only the second double-digit daily amounts in December. For Washington, it's the fourth. 9 pm Update: Yet another inch at BWI, now at 18". Light snow continues at all 3 locations. 8 pm Update: BWI reports another inch, 17" on the ground. No change at National or Dulles. Given the inconsistency with the snow amount and the over 1" of liquid at Dulles, the National precipitation amount cited earlier (0.33") is most likely incomplete, possibly from freezing of the instrument or blowing of the snow away from the instrument. 7 pm Update: Dulles reports another inch, 17" on the ground. 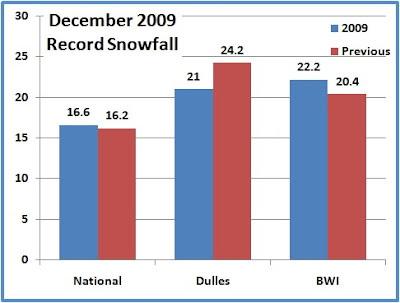 National is at 15", BWI no change. The 1.11" of liquid precipitation at Dulles is a record for the date. 6 pm Update: Baltimore (BWI) reports 16" on the ground in the latest hour. This would imply a total snowfall in the top 10 for Baltimore records dating back to 1891 and the highest in December. The 8th place snowstorm in the all-time record list is March 15-18, 1892 with 16.0". Dulles is at 16", National no change. 5:30 pm Update: Updated unofficial reports. 5 pm Update: Dulles Airport now has an official report of 15" of snow on the ground; no increase at National. This puts Dulles close to the second highest December monthly total of 15.9" in 1969. The December record is 24.2" in 1966. 4:40 pm Update: The preliminary climate report for today has been issued with the snowfall amount listed as "MM" (missing), so the official record will be delayed. Interestingly, the precipitation amount is given as 0.33", which would have been only 3.3" at a typical snow/liquid ratio of 10:1. 4 pm Update: National adds another inch but depth on ground is still 14"; Dulles also at 14" on the ground with a cumulative amount of 16". 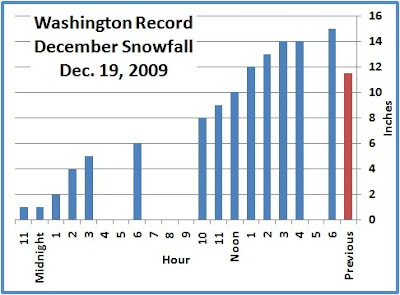 Cumulative snowfall is probably now within the top 10 all-time biggest storms in Washington. Updated unofficial reports as of 3:23. 3 pm Update: Added snow depth chart and updated total to 14". It's as easy as A + B = C.
The 1973 amount consisted mainly of 6" on the 16th and 4.2" on the 17th. The last time 10" fell on a single calendar day was Dec. 4, 1957 with 11.1". Since records began at the current National Airport location in 1929, there have been only two other December days with 10" or more: the 26th in 1941 (10") and the 17th in 1932 (11.5"). The 11.5" in 1932 holds the all-time December daily snowfall record. Of the 12 heaviest 3-day snow totals (12.7" or higher), none have occurred in December. 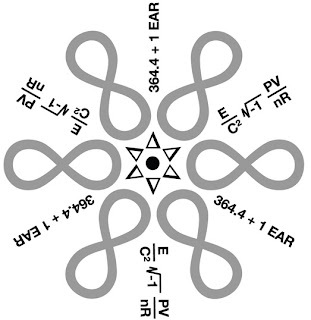 Energy and math symbols holiday snowflakes from MIT, animated version here. "It snowed in Houston!!! And, they elected a lesbian mayor!!! And, scientists get paid!!!" Dec. 21 Update: After several days of drying out, the latest 5-day precipitation forecast (to the right) issued this morning from the National Weather Service/NCEP shows the Gulf Coast getting hammered again, and the forecast discussion from New Orleans indicates the likelihood of severe weather as well. Noon Update: An additional 0.68" fell after midnight, raising the monthly total to 24.93", just 0.18" below the all-time record. Baton Rouge also set a daily record with 2.41", exceeding the 2.35" in 1961. The 13.14" through midnight at Mobile is a new December record, breaking the record which has stood since 1853. Unofficially, Mobile has received another 0.63" since midnight. December 18 Update: A total of 1.77" on Thursday brings the New Orleans December rainfall to 24.25", within less than an inch of the all-time record for any month. The Thursday amount is a new daily record for December 18, the third time this has happened in the last 4 days. The old record was 1.46" in 1995. El Niño events tend to bring heavy rainfall to the southern U.S., including the Gulf Coast, and the current one is expected to be no different, but the first half of December has gotten off to a spectacular start. Aided by two consecutive record-breaking days, New Orleans Airport has doubled its previous December monthly rainfall record in just two weeks. Monday's 3.28" broke the December 14 record of 2.04" set in 1976, and Tuesday's 5.70" almost doubled the daily record of 2.87" set in 1970. Halfway through the month, the December total of 22.48" is more than double the airport record of 10.77" set in 1977. It also exceeds the metro New Orleans December record of 14.43" in 1905. This is now the wettest month ever recorded at the airport since records began in 1947, easily surpassing the 21.18" in May 1995. The total is also within about 2.5" of the all-time New Orleans area monthly record of 25.11" mainly produced by a tropical storm in October 1937. Area records extend back to 1871. The excessive rain has led to widespread street flooding in the New Orleans metro area. The monthly rainfall so far of 12.70" at Mobile is the second wettest December total in records extending back to 1842. The record is 13.09" in 1853. Animated time-lapse video of anthropogenic carbon dioxide emissions in map form, spanning the 18th century until this current first decade of the 21st century. Shows the start in England and radiating to Europe, US and then Asia. The video makes it easy to visualize the geographical distribution and trends in post industrial revolution anthropogenic carbon dioxide emissions over 255 years. Whether you are worried about the consequences of carbon pollution or a sceptic of global warming, you should take a look, since this data is based on recorded use of fossil fuels, gas flaring and cement production, but not land-use changes. The majority of anthropogenic CO2 emissions are represented in this video by Robert W. Corkery using data from ORNL on a Nasa Blue Marble background image. Music copyright Robert W. Corkery 2007. While not as drenching as the previous event, Sunday's precipitation added almost another half an inch to Washington's soggy December totals. The month-to-date amount of 3.47" is now well above the average for an entire December and over 150% of the month-to-date average. Even an average amount through the rest of the month will be enough for the total to finish over 50% above average. The year-to-date amount of 43.58" is also well above the yearly average of 39.35", although it's almost 3" below last year's near-record total. What I hope we all got out of this is that the Earth is warming at an unprecedented pace, that there is ample evidence for that, and that human activity is largely to blame. It is now up to the United Nations Framework Convention, 15th Conference of the Parties in Copenhagen, to help us solve this problem. Full text is at the silicon-based WaPo. In honor of AOL once again becoming an independent company today, here is the Washington, DC forecast from The Weather Channel via AOL Video (click the link to select other locations). Back in the days when the Web was young, the Climate Capitalist was a Systems Performance Analyst at AOL. Eli knows what you’re thinking. “Is climate change really happening?” Well, to tell you the truth, in all this excitement the bunny kind of lost track himself. But being greenhouse gases are the most powerful forcing we know, and the best science predicts disaster ahead, you’ve got to ask yourself one question: Do I feel lucky? Well, do ya, punk? The major storm moving through the central part of the U.S. brought record-breaking rain for December 9 to the Washington/Baltimore metro area. The 1.29" which fell at Washington National exceeded the record of 1.05" set in 1931, although that was previously the lowest daily record for December. Baltimore (BWI) also broke its record with 1.41", well above the old record of 1.08" in 1991. Washington Dulles, on the other hand, with a much shorter period of record, had 0.93", which failed to break the 1973 record of 1.12". 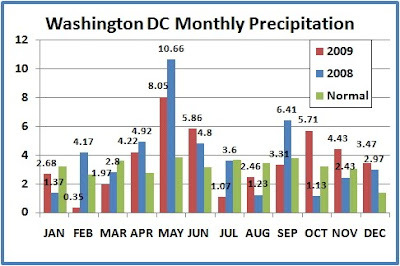 In the first 9 days of the month, Washington National is now within 0.01" of the average total for all of December. This is almost 2.5 times the average December amount to date. At 4.43", the November rainfall was just under 50% above average. April, May, June, and October, the other above-average months this year, have all been at least 50% above. February and July were over 50% below average. 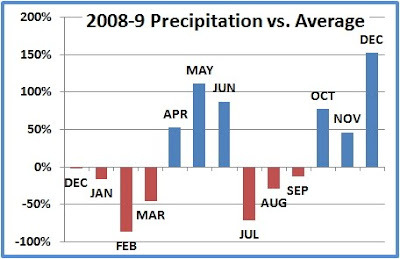 If current trends continue, December will be the seventh month in 2009 which is at least 50% above or below average. Following a cold October, U.S. temperatures rebounded strongly in November to reach their third warmest levels on record. The preliminary analysis for November 2009, posted by the National Climatic Data Center this morning, shows that the monthly average of 46.5°F was 4.0°F above the 20th Century average. Regionally, the Southwest and South were above normal, and the West North Central through the Northeast were all much above normal. Only the Northwest, West, and Southeast were near normal. Temperatures were in the top 10 warmest for 18 other states, and no individual state was below normal. Precipitation was heavy in the Southeast, Mid Atlantic, and northern New England, but most of the country was drier than average in November. Nationally, it was the 18th driest November since 1895. Virginia had its second wettest November, and North and South Carolina had their sixth and ninth wettest Novembers, respectively. On the other hand, nine states had precipitation in the top ten driest Novembers, and 25 states in all were below average. This 10-week course for non-science majors focuses on a single problem: assessing the risk of human-caused climate change. The story ranges from physics to chemistry, biology, geology, fluid mechanics, and quantum mechanics, to economics and social sciences. The class will consider evidence from the distant past and projections into the distant future, keeping the human time scale of the next several centuries as the bottom line. 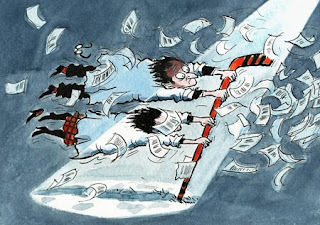 The lectures follow a textbook, "Global Warming, Understanding the Forecast," written for the course. The files are in Quicktime format (m4v), which should be iPod compatible. 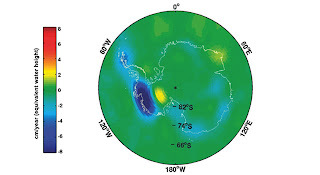 A paper published online this week in the journal Nature Geoscience, "Accelerated Antarctic ice loss from satellite gravity measurements", shows increased rates of ice reduction in Antarctica. The data from the GRACE satellite confirmed earlier indications of ice loss in West Antarctica at the rate of 132 gigatonnes of ice per year. More surprising, however, was the result that East Antarctica, which had been considered stable, is also losing ice mass. The rate of decline in East Antarctica is estimated at 57 gigatonnes a year. The estimates, based on satellite data from 2002 to 2009, show the maximum loss rates in coastal areas. While we are seeing a trend of accelerating ice loss in Antarctica, we had considered East Antarctica to be inviolate. But if it is losing mass, as our data indicate, it may be an indication the state of East Antarctica has changed. Since it's the biggest ice sheet on Earth, ice loss there can have a large impact on global sea level rise in the future. 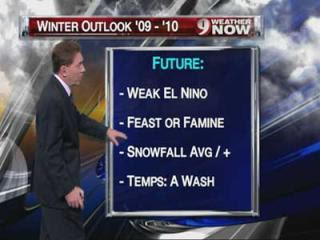 NOAA's Climate Prediction Center winter 2009-10 outlook, updated this morning, continues to expect a pattern strongly affected by El Niño. Like the preliminary outlook issued a month ago, the latest one features warmth from Washington and Oregon southeastward through the Rockies, northern Arizona, and New Mexico and across much of the Midwest to Wisconsin and Michigan. Cool temperatures are predicted from the Gulf Coast through the Southeast to the Mid Atlantic area as far as extreme southern Pennsylvania and New Jersey. Also consistent with a persistent El Niño is a precipitation pattern with above-average amounts from California through most of Texas, the southern Gulf Coast states, Florida, and the southeastern Atlantic coast. The main difference from the previous outlook is an increase in the probability for warmer than average temperatures to 50% or above in North and South Dakota, Minnesota, and northernmost Wisconsin and Michigan. The previous record for the month of October and for any month of the year was 34.4°C, most recently in October 2008. This October, the daily maximum temperature during the month reached 35.0°C on 13 days, the highest on record for any month, and there were another 4 days with 34.9°C. Record warm temperatures have continued into November in Australia, where Adelaide in South Australia has recorded its first ever spring heatwave of 8 consecutive days above 35°C; 5 consecutive days are required for a heatwave, and the previous record was 4 in 1894. Steven D. Levitt and Stephen J. Dubner are to blame for the global financial crisis. See, back in 2005, they wrote "Freakonomics," a wildly successful book brimming with interesting stories about why incentives matter and how actions have unintended consequences. Indeed, incentives do matter, and actions (or publications) do have unintended consequences: Their book made economists around the world more inclined to come up with cute little analyses of the business of being a drug dealer or the impact of a first name on a child's success. And that distracted them, so they didn't notice the giant housing and credit bubbles that in hindsight were plain to see. A global collapse ensued. Both of those problems are mild compared with the ones in the penultimate chapter, in which the authors bring their oh-so-clever approach to the climate debate. The standard strategy for preventing potentially catastrophic global warming, one advanced by an overwhelming consensus of climate scientists and environmental economists, is to put in place policies to reduce the amount of carbon dioxide humankind emits. That's apparently too conventional for Levitt and Dubner, who spend the vast majority of their chapter (with time taken out for potshots at Al Gore) examining the work of scientist/entrepreneur Nathan Myhrvhold's crew, a group that is exploring the idea of pumping sulfur into the upper atmosphere and other neat tricks that just may be cheaper, easier ways to combat global warming. It would be great if one of those schemes turns out to work. Fantastic, even. But Levitt and Dubner seem to simply presume that because one of them might work, Gore et al. are foolish to push to reduce emissions. It is like a family declining to save for college because their 10-year-old Little Leaguer with a decent arm may end up getting a full baseball scholarship. To be skeptical of climate models and credulous about things like carbon-eating trees and cloudmaking machinery and hoses that shoot sulfur into the sky is to replace a faith in science with a belief in science fiction. This is the turn that “SuperFreakonomics” takes, even as its authors repeatedly extoll their hard-headedness. All of which goes to show that, while some forms of horseshit are no longer a problem, others will always be with us. Kolbert held an online discussion of the subject on November 11. The Council of the American Physical Society has overwhelmingly rejected a proposal to replace the Society’s 2007 Statement on Climate Change with a version that raised doubts about global warming. 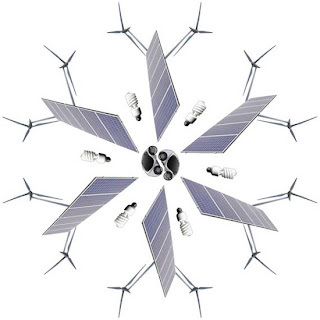 The Council’s vote came after it received a report from a committee of eminent scientists who reviewed the existing statement in response to a petition submitted by a group of APS members. The petition had requested that APS remove and replace the Society’s current statement. The committee recommended that the Council reject the petition. The committee also recommended that the current APS statement be allowed to stand, but it requested that the Society’s Panel on Public Affairs (POPA) examine the statement for possible improvements in clarity and tone. POPA regularly reviews all APS statements to ensure that they are relevant and up-to-date regarding new scientific findings. DeSmogBlog has a link to an analysis [2MB pdf] by John Mashey exhaustively deconstructing the petition and its signers. The American Physical Society Stays Real. APS rejects plea to alter stance on climate change. The only region with near normal temperatures was the Southeast, where Florida was the only state with warmer than average temperatures. The national average precipitation of 4.15" was almost double the long-term October amount of 2.11". The East North Central and South regions both had their wettest Octobers, and the Central region had its second wettest. Three states had record wettest Octobers: Iowa, Arkansas, and Louisiana. Fourteen other states were ranked in the top five wettest for the month. 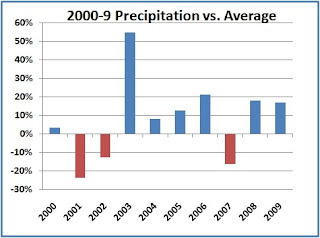 Only three states had below-normal precipitation.